What’s the sound of a daydream? How do inner voices and sounds change when you’re sitting in a café or, for instance, riding a bike? Inspired by the sound installation Flesh (January 20–April 9, 2017) by artist Hanne Lippard, pupils of Heinz-Brandt-Schule address these questions. 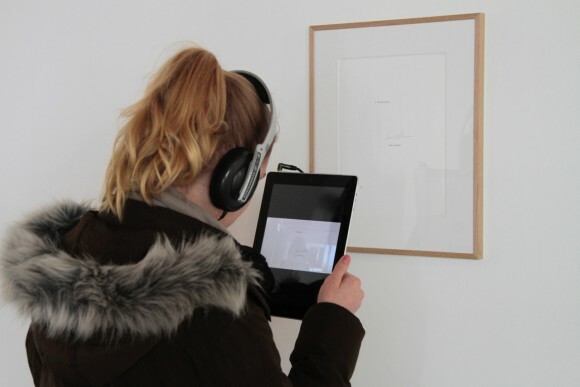 During their project in March 2017, the students developed an audio track for a pre-produced videowalk through the courtyard and the exhibition of KW, exploiting the sound of their everyday thoughts. This resulted in texts, sound poems and sketches, which were made using percussion, guitar, synthesizer and singing. In the end, a ten minute long videowalk came into being, which leads you through a world of disembodied voices and sounds. Simultaneously, the project “Motion Workshop” focussed on the body and its immediate presence. Repeated meditation exercises and a daily warm-up prepared the students for active hours in the premises of the KW. The students began the week by exploring the exhibition space on the ground floor and in the main hall, in order to physically relate to the presented work by artists Hanne Lippard and Ian Wilson. The research towards possible narratives was continued with the development of performative duets. With the help of reduced choreographic guidelines, each couple developed an encounter – aggressive, friendly or shy. The resulting sequences of movements were supplemented by short texts and statements, which arose by the confrontation with the exhibition. If you met yourself as an 80 year old, what would you say to yourself? How long can you hold your breath? Where do you see yourself in ten years? What would you do if this were to be your last day? Like Hanne Lippard and Ian Wilson in their artworks, the youngsters occupied themselves with small and big questions related to time. On the last day, the results of the project week were presented in the KW, together with classmates from the Heinz-Brandt School and other guests. After a warming-up game of Chinese Whispering with the participants in the studio (located in KW’s front building), visitors could explore the inner courtyard and the premises of the KW in a ten-minute Video-Walk. Afterwards a 15-minute performance followed, in which the students recorded different positions in the exhibition space. Finally, a concert with music from the videowalk took place in the exhibition space. Project development: Alexia Manzano (student of weißensee kunsthochschule berlin) and Norbert Lang (freelance radio producer and sound artist), Margret Schütz (a7.außeneinsatz) and Patricia Woltmann (Choreographer). The project was developed in conjunction of “Künste öffnen Welten” as part of the collaboration When Education turns to Art.